How well do you digest and assimilate your foods, your emotions, your life? A healthy digestive system is a key to vibrant energy, stamina and well being. Learn tools to enhance digestion and help you return to radiant health! We will discuss numerous herbs, effective formulas and general guidelines for healthy digestion, assimilation and elimination. Class will include hands-on activities such as preparing digestive bitters and herbal chews. Jane Bothwell is a practicing herbalist, educator, hypnotherapist and flower-essence practitioner. Jane is dedicated to empowering people with the knowledge and wisdom necessary to use plants wisely as food, medicine and spiritual support. With this learning comes a fuller appreciation of the bounty of creation and a greater ability and desire to care for oneself, one’s family and our universe. 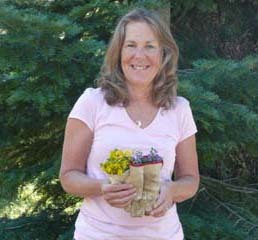 She brings 20+ years of working with clients, teaching herb classes and immersing herself in plants. Register online or bring cash or check on the day of the event. For more information, contact Herb Society co-chair, Analisa Jahna.